I recall once that a deer challenged my world view. It did so in a way by permanently separating a youth from his mother by means of the bullet. Though that youth grew into an alpha male (Bambi I think his name was) his journey ultimately made my young psyche believe that the world revolved around death, conflict, and fornication. 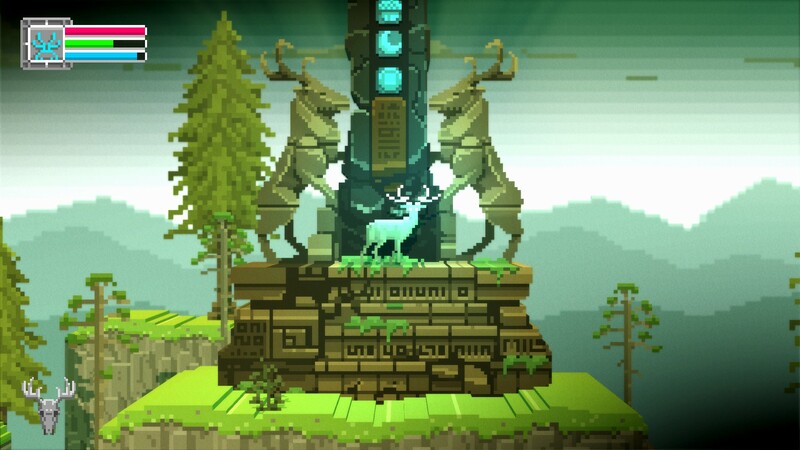 Crescent Moon Studios seeks to challenge your outlook on life as well with its platformer The Deer God. The description from the game’s Steam page describes itself as containing themes of religion, spirituality, and karma. Such topics are personal and unique to the individual, and the same could be said for the game’s effectiveness in delivering said topics. 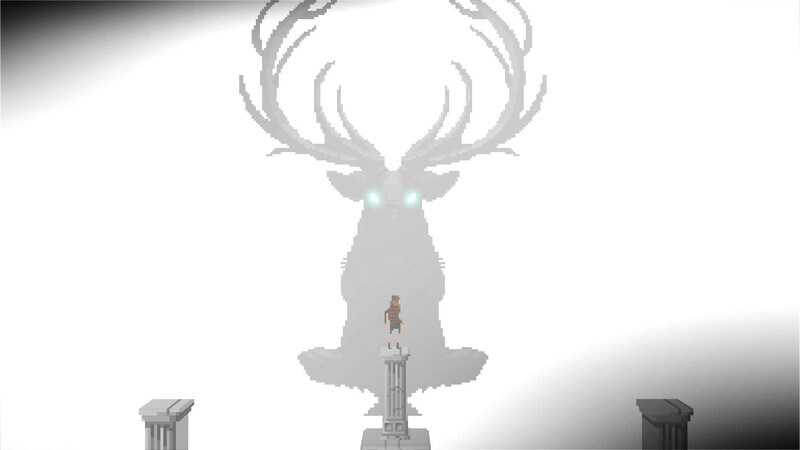 The Deer God can most simply be described as a platformer. There is jumping. There are spikes. There is the collecting of tokens. There is an “x amount of lives” system. Mario has been doing this for some time and has never been known for his existential quandaries. Naturally I felt some skepticism about the format’s effectiveness for delivering such an experience. The prevalent method in games has always been cut-scenes, which is something The Deer God uses only at the beginning and end. While cut-scenes get the point across, they don’t particularly play to the strength of interactivity of the medium. With very few cut-scenes, The Deer God has to get its point across primarily through the gameplay and presentation. Reincarnation and karma are two recurring elements in The Deer God. This is initially presented in the opening with the player’s character, a hunter who is punished by a supernatural force, for the killing of a young deer. He is thus transformed into a fawn. From this point on, the player commences running and jumping from fawn-hood to stag-hood. In the most basic sense, reincarnation appears in the game’s take on the life and checkpoint system. With the collection of life tokens, this is not a new idea, but after the loss of all life tokens, a second checkpoint system comes into effect. Upon adulthood, the hunter-deer may have a PG love scene with any random doe he comes across, resulting in an insta-baby. The fawn may follow his father, but he will likely come across an obstacle his AI can’t handle. It typically seems best to have the hunter-deer’s fawn stay with momma. Should the hunter-deer run out of lives, he can be reborn as his offspring, starting the maturity process all over while still retaining everything else he had acquired. Like Revan, but with antlers. Morality exists in the form of a Red vs Blue bar, much like we’ve seen in space RPGs made by Bioware. Completing altruistic side objectives and assisting other critters makes the Light bar increase, while bashing the hell out of other critters makes the Dark bar increase. Truthfully I cannot say what the ramifications are for maxing out one or the other. Due to the blitz-like nature of the platforming, I sped right through to the end within 3 hours. I largely found fighting enemies to be tedious and time consuming, so my Dark bar remained quite small. I can presume I missed some hidden objectives as my Light bar wasn’t especially full by the end. Perhaps this results in an unintended message that conflict is a largely tedious and painful thing to pursuit. I find most games (fun or not) have that certain something that’s hard to pinpoint. This is something especially true for The Deer God. This I would suspect is a result of the aesthetics, level design, and audio. The artwork joins this recent renaissance for 8 and 16 bit pixel art. A valid criticism for this choice in modern games is that it sometimes comes off as a cheap way of milking nostalgia rather than using it to do something original. The Deer God uses the style to convey the idea of nature without trying to create a realistic depiction. Perhaps the best example is when the hunter-deer idly looks to the fourth wall, his eyes being nothing more than a few simple yellow squares. 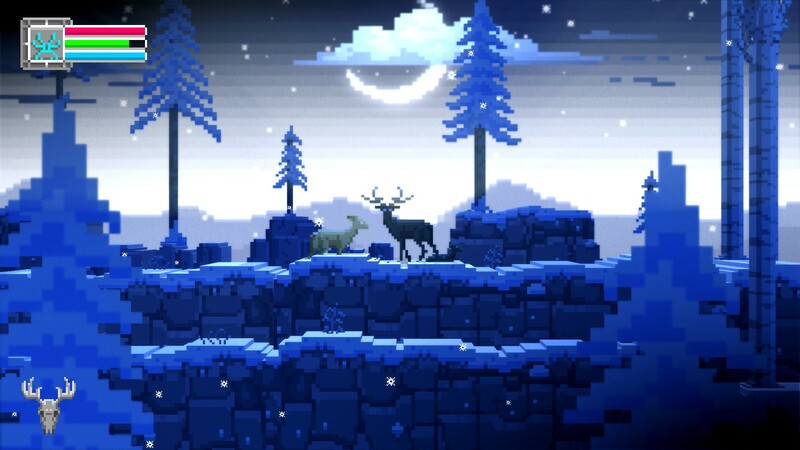 No great amount of drawing is done here, but the contrast with a brown pixel body is what creates the idea of a deer staring at the viewer with light shining on his eyes. There is something to be said for the ability to convey light and shadow using only limited tiny blocks of color. The pixel world is further broken down into a limited selection of building blocks. While various seasons and terrain are present during the running and jumping, they always are composed of a handful of level designs. Not only will the hunter-deer come across the same design twice, but speeding through without finishing a task will result in an endless loop of globetrotting until the task is complete. It’s the same mechanic as in Pac-Man where if the player “wakawakas” their way through that passage on the right, they’ll emerge instantly from the passage on the left. For The Deer God, this creates a weird sense of dejavu until the player realizes why it is they haven’t advanced any further. For me it resulted in going into an auto-pilot state of chin scratching which is probably what I could describe as that Zen-like experience that’s hard to pinpoint. I don’t know if I’d say that The Deer God challenged my world views on religion and spirituality. I would say that it does a better job at challenging the perspective of how well certain game mechanics convey that of which they represent, or if they even represent anything at all. The “lives” system has never really represented life in platformers. Lives merely represented how many do-overs the game would allow the player. The Deer God instead says that the lives system instead represents the protagonist’s chances to rethink their mistakes in life and how long they have until missing the opportunity for enlightenment. Or some kind of hippie thing like that.